This is a BORING birthday book for my youngest daughter’s birth date that I am turning into a journal. I know that BM journallers can make it way more interesting. I would like this book to basically be about the same thing – but with more pizazz. Anything on the month of November, celebrating birthdays, Thanksgiving, other November holidays or days of interest, or the zodiac sign Sagittarius are appropriate. Also, feel free to make your entry using anything that’s on the original page or cover the page with a piece of paper. Use as many pages as you would like, just don’t alter anyone elses work. Please make your entry and relist within two weeks. If you don’t mind relisting when you receive the journal (in order to speed the process up) please do. 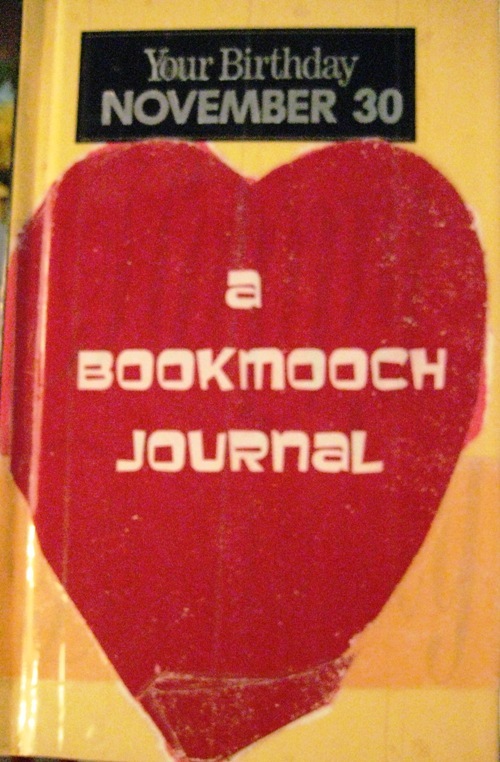 PLEASE RELIST ONLY ON BOOKMOOCH by entering the BMID number listed in the front of the journal in the ISBN block and notify me when the journal is full or needs repair.